Coach Springer presents these scoring drills used by Tim Duncan - NBA All-Star. Diagram A. Duncan and teammate Tony Parker have mastered the pick and roll. In this scoring sequence Tim picks and pops for a catch and shoot jump shot. 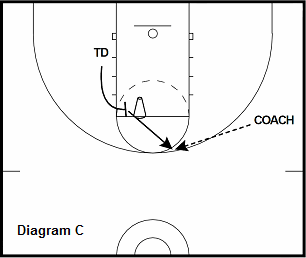 Drill: Screen the ball handler and pop for 15 catch and shoot makes. Do to both sides of the floor. Diagram B. Duncan will sometimes set a screen at the high post and dive to the opposite block for a pass and layup. 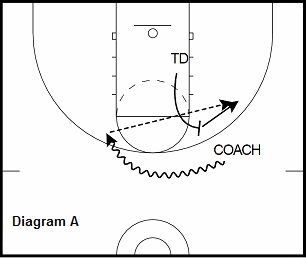 Drill: Screen the coach and dive for a layup off the catch. Make 20 to each side of the rim. Diagram C. Coming from the weak side, Duncan will set a flare screen for a guard and then flash to the middle for a catch and shoot. 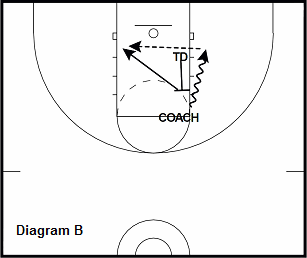 Drill: Screen the cone and flash to the middle for a jump shot. Make 20 on each side of the court. Diagram D. Because of teammate Tony Parker's speed, Parker will often draw both his defender and Duncan's defender on the pick and roll. Duncan will then relocate to the high post for a catch and shoot. 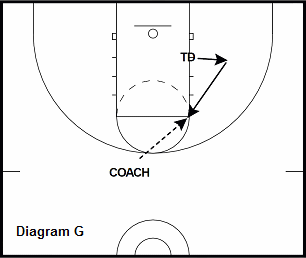 Drill: Screen for coach and relocate to the high post for a catch and shoot. Make 20 going in both directions. 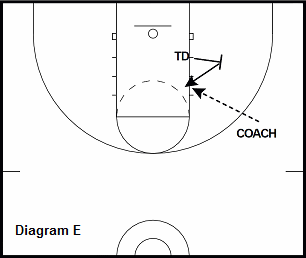 Diagram E. To clear the side, Duncan will set a back-screen to send the same side guard through. He will then post up and maxmize the space. Duncan uses various post moves when he gets the ball. Moves: Sweep baseline for layup, back down to middle and spin baseline (layup or shot), back down to baby hook in the middle, 1 dribble step back jumpshot. 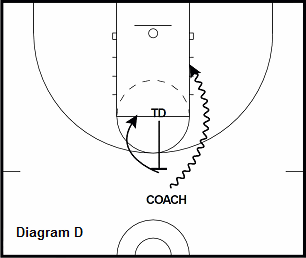 Drill: Make 15 of each move after setting the back screen and posting up. Diagram F. Duncan is good at reading the lanes that open up from the guards driving to the basket. He will dive in the lanes and receive a pass when the defense has collapsed on the guard. 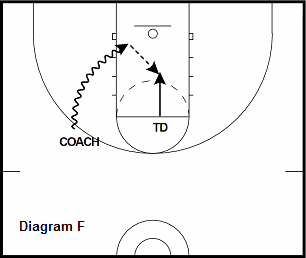 Drill: Follow the coach on the drive to the dump pass and score 20 times. Diagram G. Duncan will fake the same back-screen he uses to post up. At the same time, a guard will down-screen for him. Duncan will then flash to the elbow for a catch and shoot. Drill: Fake the back screen and flash to the elbow for a catch and shoot.